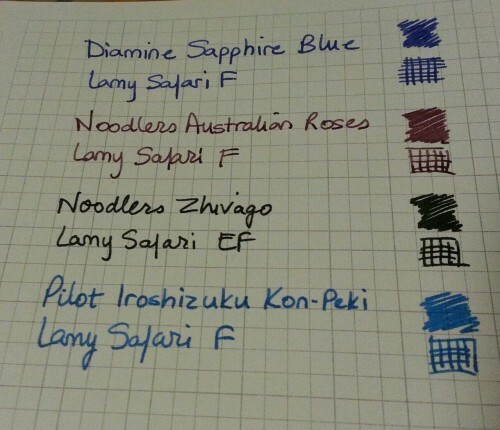 Diamine Sapphire Blue – um, this ink looks WAY more purple coming right after Bay State Blue. I even dumped it back into the vial and refilled the pen, just in case. It just looks purple. I think BSB has ruined me for blue now. Noodlers Australian Roses – kind of a darker, muted, grayed version of Private Reserve’s Arabian Rose. The more I looked at it, the more I dislike it. It’s just kinda ugly reddish brownish mauvey purplish red. Noodlers Zhivago – very very dark green. Okay, its really more like black with a hint of green. I kinda like it, but it’s so close to black, I’d be more likely to use my Heart of Darkness I think. Pilot Iroshizuku Kon-peki – pretty!! I really like it, its a mild bright sky blue, not too dark, not too teal. Just blue. I’ll be evaluating these more over the next week or so, so we’ll see which I end up liking the best. Right now, based on first impressions I think the Kon-peki will be my favorite.